Reclaiming Public Water is a contribution to the long overdue refocusing of the global water debate on the key question: what needs to happen, from the local to the global level, to improve and expand public water and sanitation around the world? The disastrous privatisation wave of the 1990s has made clear that the water needs of the poor should not be left in the hands of the profits-driven, transnational corporations. In cities around the world, global water corporations have failed to deliver the promised improvements and have, instead, raised water tariffs far beyond the reach of poor households. Reclaiming Public Water shows that there are attractive and viable alternatives both to water privatisation and to often bureaucratised and ineffective, state-run water utilities which, in large parts of the developing world, fail to supply clean water to those that need it. Challengeing the neoliberal prejudices of governments and international financial institutions, the book presents a wide range of concrete examples from around the world of how urban public water can be improved through democratic utility reforms, such as the introduction of comprehensive forms of citizens participation. It also daws on the rich experiences of anti-privatisation coalitionsand their visions on making public water work. 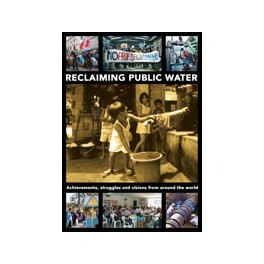 Written by public water utility managers, trade unionists and civi society activists from more than twenty countries, Reclaiming Public Water is part of a continuing global process of mutual learning trhough sharing of experiences. The book is available for free as a download on www.tni.org. There you will also find it translated in many languages.